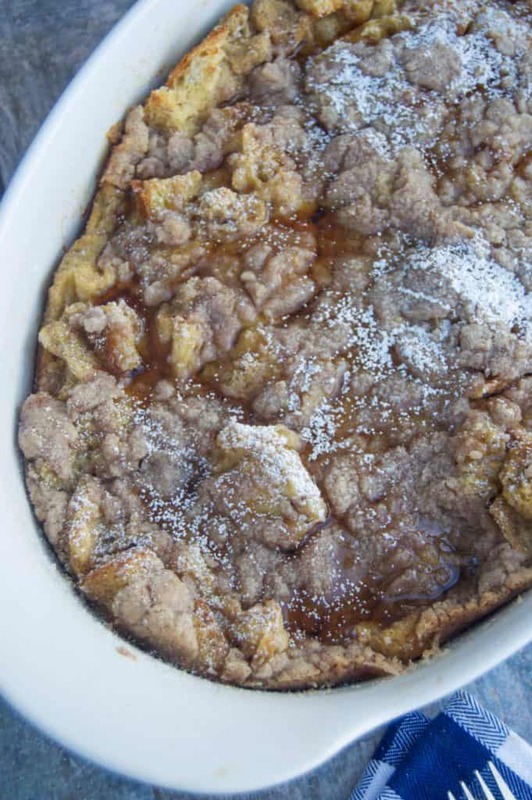 Your favorite breakfast dish baked all together in this easy French Toast Casserole. Don’t worry this isn’t an overnight recipe, it’s ready in an hour. You can make ahead the night before if you want! I can’t lie to you with this recipe. It’s completely meant for breakfast, but I totally made it for dinner! I mean who doesn’t love brinner am I right? The best part is we had left over for breakfast, and I was able to sleep in and not have to worry about cooking in the morning. That’s what I like to call a win-win! Cooking breakfast for dinner is a favorite of mine, and we did it again tonight with this low carb breakfast casserole. I think my kids would eat just about anything that I put syrup on! 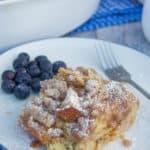 I topped this French Toast Casserole with syrup and powdered sugar and the entire family loved it. I used sourdough bread for this recipe, but you can use any thick sliced bread like a Texas toast or even a french loaf. This is. breakfast casserole you can eat at any time of the day! 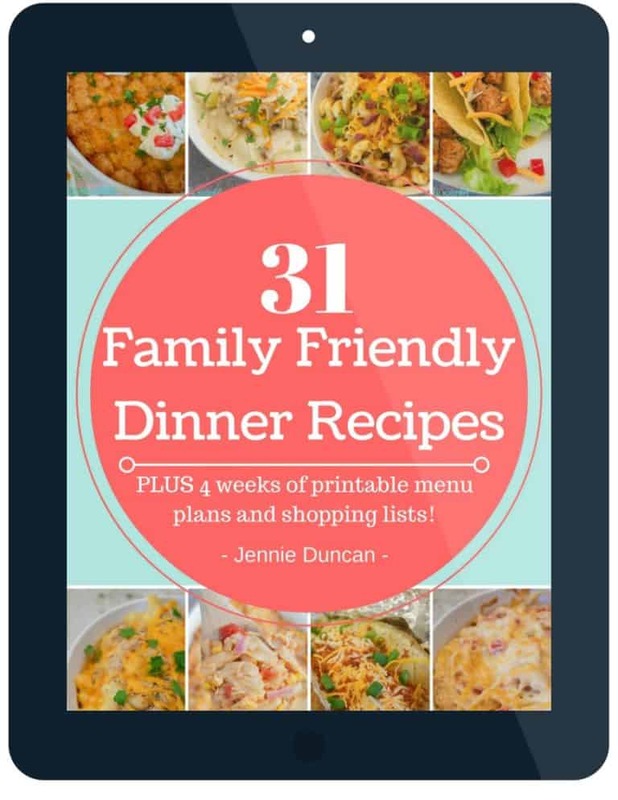 Make sure you sign up and get your free meal planning printable! 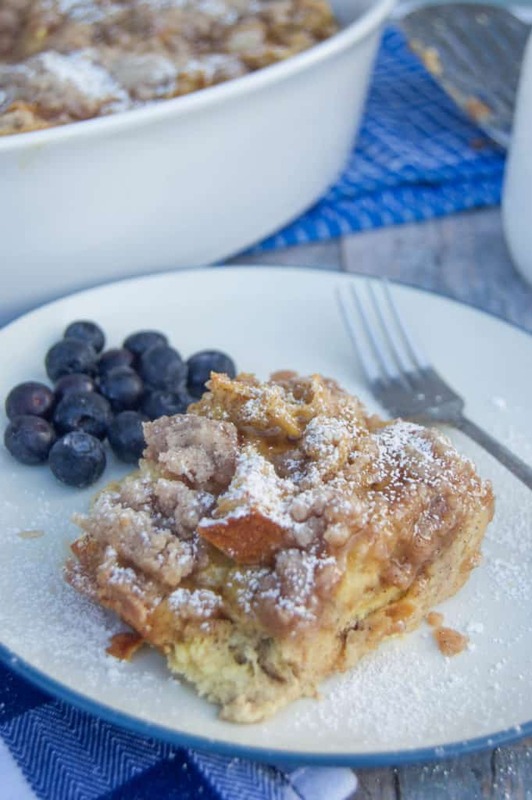 Your favorite breakfast dish baked all together in this easy French Toast Casserole. Don't worry this isn't an overnight recipe, it's ready in an hour. Preheat oven to 350 degrees F. Prepare a baking dish (9X13) with cooking spray and set aside. Whisk together eggs, milk, half and half, sugar, brown sugar (first 1/2 cup) vanilla, and cinnamon in a large mixing bowl. Cut bread into bite size pieces and add to bowl with egg mix. Gently mix together until all bread is coated (careful not to crumble bread). Once all bread has absorbed the egg then place it into your prepared baking dish. For topping place all butter, flour, salt, brown sugar, and cinnamon in a small mixing bowl. Use a fork (or your hands) to mix together well until you form a crumble. Crumble this on top of your casserole. Bake for 45-50 minutes until cooked through and a toothpick could come out clean. Optional: serve topped with powdered sugar and syrup. Hi Lynn! One loaf that is about 15-16 oz. =) I will update the recipe to make that clear! 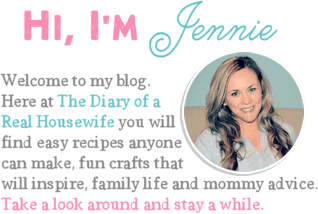 Thanks for stopping by and I hope you love the recipe. You will have to let me know how you like it!! Could this be made as a freezer meal? Assemble, and freeze before baking? Hi Kellie, to freeze this I would mix the base ingredients in large freezer bag. Then then mix and place the toppings in a separate bag. I would place it in the fridge the night before baking then into a casserole dish to bake. Hope that helps!! Yah!! So happy to hear that! This was a great recipe! I used French bread because it’s what I had on hand. I didn’t expect it to puff up so big – almost overflowing the sides – but after being out of the oven a couple minutes, it went down. There were zero leftovers because everyone loved it. So glad to hear that you all loved it so much Kathie!! Could this be a meal I prepare the night before & stick in the fridge & then cook the next morning? Hi Makayla, this recipe is great made the night before then baked in the morning! I usually mix it up and into the casserole dish and cover it with plastic wrap. If this is prepared the night before can you add the bread and everything? Yes this recipe will perfect to make the night before and bake in the morning. I hope you enjoy it! Just made this for Christmas morning! Looks delish and so easy!! Can’t wait to try it! I used brioche bread. Yah! So happy you liked it! Thank you so much for letting me know. Happy New Year! Made this for our New Year’s brunch. Added 3 tablespoons melted butter and 1/4 tsp. of salt to the egg mixture and 1/4 tap of salt and 2/3 cup of chopped walnuts to the topping. Amazing! Will be making it again. Thanks for sharing! Yuma I have to try this with walnuts, that sounds amazing! So glad you enjoyed it Jill and I really appreciate the review! It doesn’t seem like all the egg mixture gets absorbed, is this correct? Yes, that is correct as long as when it is baked it’s all cooked through. The extra eggs will help keep everything stuck together after baking. Thanks Jennie for the quick response. We really loved it and I will add this recipe to my regular breakfast weekend routine.